Members, following up on our presentation and discussion during yesterday’s meeting, we have created a Jobs Board page on this website. See the link at the top of the main page. The page is password protected and available to members only. Please feel free to contact Paul Karlsgodt for the password information. Dear I addressed the Inn of Court a while back on the International Tribunals. I wanted to let you know about an upcoming event that will be discussing similar issues. 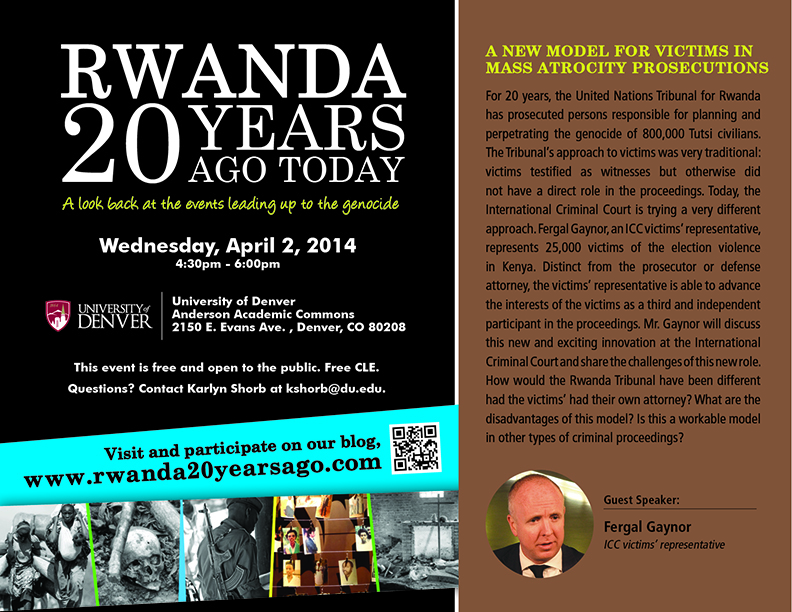 On April 2nd at 4:30 at Anderson Academic Commons (main DU library), our speaker is going to be Fergal Gaynor, the victims’ representative at the Int’l Criminal Court in the case against sitting president of Kenya. In an innovation at the international tribunals, he is appointed to represent the 20,000 victims and appears as a party independent of the prosecutor and defense attorney in the proceedings. He will be talking about this new kind of trial counsel, and the differences in the representation and participation of victims at the Rwanda Tribunal versus this new model at the ICC. Our next meeting is March 20, 2014 at 6:00 p.m. at the University Club in Denver. This is the first post for the new site. Welcome members and friends. We hope that this website meets your wildest expectations.